Joan Embery is a champion of environmental, conservation and preservations issues around the world, most notably as spokeswoman for the Zoological Society of San Diego. On behalf of these issues as well as the San Diego Zoo, she has made over a thousand television appearances including over 100 appearances on the Tonight Show with Johnny Carson and Jay Leno as well as her own syndicated series “Animal Express and “Animals of Africa”. 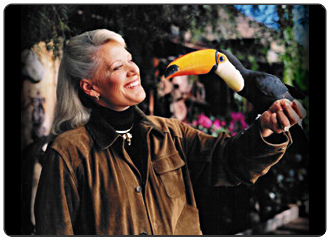 Many of these appearances were with one of her Toco Toucans, which she acquired from Emerald Forest Bird Gardens. Joan has led numerous wildlife expeditions to exotic locations throughout the world and is the author four books. Joan serves on many nonprofit boards most of which focus on conservation and wildlife issues and in 2004 established The Embery Institute for Wildlife Conservation with the mission of connecting people to wildlife and conservation issues and the role each individual plays in insuring healthy environments. She is also an accomplished horsewoman, having won trophies in almost every discipline and lives on a 50-acre ranch in Lakeside, California with her husband Duane Pillsbury. Visit Joan at her website here.